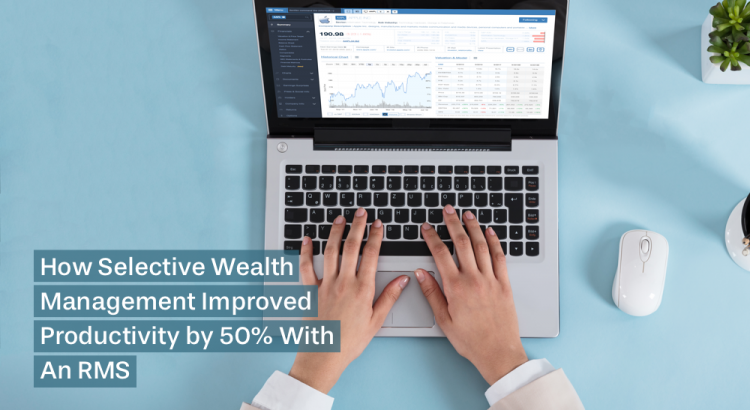 With a lean team and a rigorous research process, Chris Devlin, founder of Selective Wealth, wanted a solution that would save him time. He wanted to spend less time trying to find information, and more time analyzing his findings to create more alpha-generating ideas. Before switching to an RMS, Chris saved notes in Word documents within ticker-labeled file folders on his desktop. This involved a lot of time spent copy-pasting and annotating outside of the original documents, and it was also challenging to keep track of different document types and ultimately build a thesis in a reasonable amount of time. He saves hours creating and sharing notes with his team inside the RMS, instead of using Word docs and emails. The Vision Research team needed a tool that would allow for thorough document research, but also allow them to quickly organize and communicate ideas across their remote team. One of Vision’s clients recommended Sentieo to Robert and his team, and they were immediately impressed with Sentieo’s Document Search, and especially Sentieo’s Notebook research management system. Robert and his team members have been using various document search tools for over a decade, including Thomson Reuters StreetEvents and Alphasense. However, they now solely use Sentieo, which has powerful search functionality, but also integrates with the rest of their workflow very easily. Sentieo has been a timesaver in both of these tasks, allowing the team to experience 75% time savings when compared with previous platforms. The team especially likes the Document Search redlining tool, which allows them to compare language from the same document type from different quarters. One feature that the team was not able to find in Alphasense or other platforms was a table extraction tool that allowed them to extract tables from any document and push them into Excel. Sentieo allows them to do this and more, including the ability to extract and easily compare tables historically over quarters or years. With the Sentieo TableX suite, the team spends 50% less time than it used to on modeling activities. The Sentieo Notebook was the platform’s biggest selling point for the team. Before Sentieo, the team used a shared cloud drive to store files, and communicated information using only hundreds of emails and Excel spreadsheets, which ended up being a very inefficient process for them. Now the team is able to create notes and categorize them for easy organization across the team. They have created a system where they can share ideas and label them “Reviewed” “Unreviewed,” and more. Everyone on the team can comment, and there is a trail of comments and activities that they can reference at any time. This is especially helpful because the team works remotely across different offices in Dallas, and some members of the team travel frequently. The Notebook keeps their research all in one place, transparent across the team, and has made for at least 50% time savings compared to their old process. The team started using Sentieo’s built-in equity data terminal because they ultimately wanted to replace Bloomberg, and did not want to have to buy expensive Bloomberg licenses for future junior employees joining the team. Sentieo offers all the quality financial data they need, from street estimates to trading multiples and shareholders data — at a fraction of the price of Bloomberg. The team uses the Sentieo mobile app to get instant push notifications about tickers and companies that they are following. 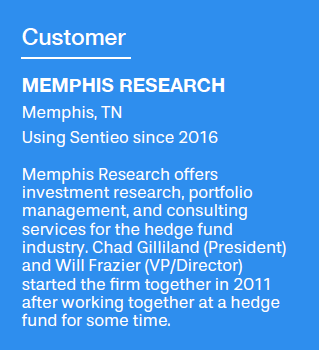 Memphis Research offers investment research, portfolio management, and consulting services for the hedge fund industry. 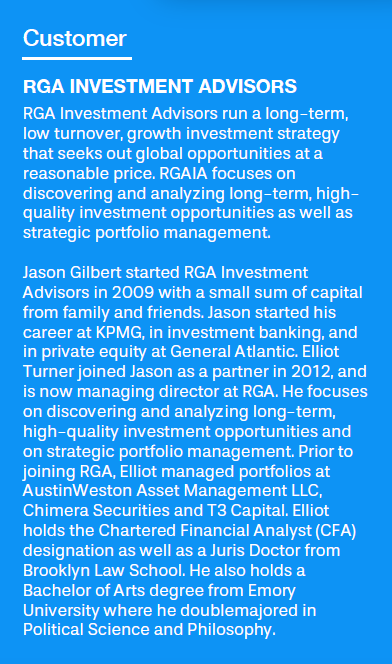 Chad Gilliland (President) and Will Frazier (VP/Director) started the firm together in 2011 after working together at a hedge fund for some time. Before Sentieo, the Memphis Research team had tried many financial research platforms, including Capital IQ and Bloomberg. All had fallen short of their expectations in a number of ways. They had un-intuitive user interfaces, limited mobile access, and were overpriced — to name a few shortcomings. The Memphis team likes to run very specific keyword searches using Sentieo’s Document Search. They are able to narrow their searches down by document type, down to the document section (ie. “Risk Factors”). One popular use case for them is searching for disingenuous language and other signifiers within call transcripts. 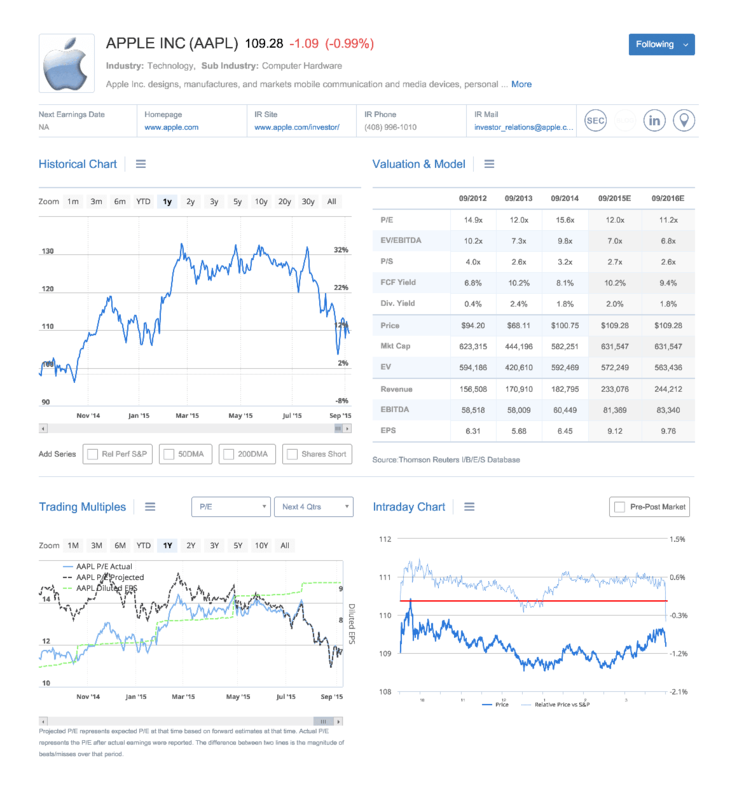 The team also uses the Document Search redlining tool, which allows them to hone in on new document language or accounting numbers that have changed across quarters or over years. 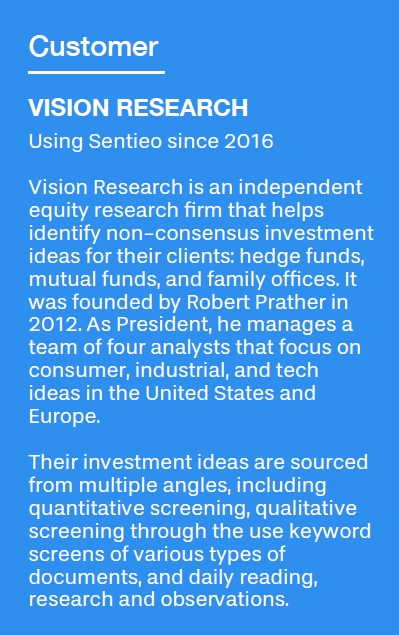 Will and Chad also “follow” tickers in Sentieo by creating Watchlists of the companies they want to track. This allows them to receive immediate updates to their email inbox whenever new filings or financial statements come out for those companies. This is especially helpful to them during earnings season, when time is of the essence. The team also keeps up with companies using the Sentieo News Stream, which is a feed of the latest social media tweets and articles about the companies they track. Will also extracts tables from documents into Excel, and compares them over time using Sentieo’s TableX suite of tools. 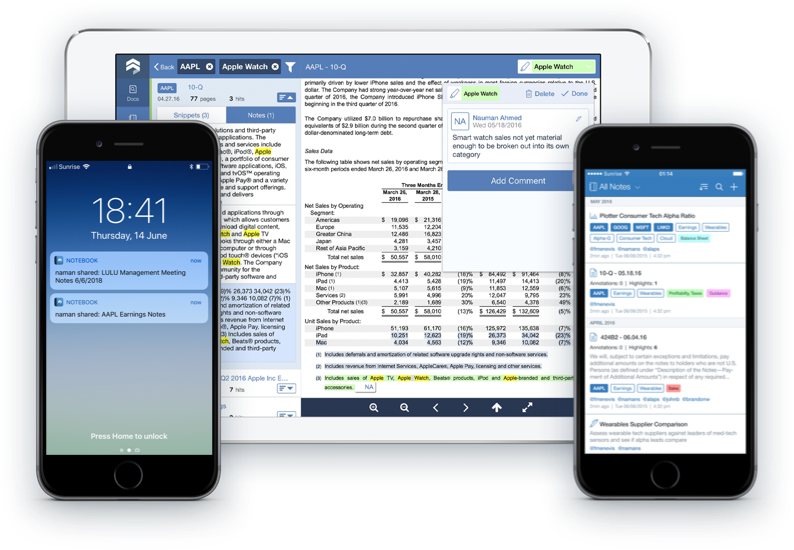 Chad uses the Notebook (Sentieo’s research management system) to store his own notes and annotations by ticker, and to search through them as needed. Chad and Will frequently travel to trade shows, and they use the Sentieo mobile and tablet apps to keep working on-the-go. With Sentieo, they are able to quickly pull up financials and estimates at their fingertips, instead of printing and taking physical 10Ks and 10Qs with them. When listening to management calls, they are able to quickly pull up the expectations for a ticker on their mobile, and compare them to what’s being discussed on the spot. Chad also heavily uses the Sentieo app for the iPad tablet.